I have, at long last, finished the Desert Rose BFL-Silk blend project. Whew! But the wonderful result is that I have just over 1900 yards of sport-weight yarn to make something lovely with. So what’s next? Bunny fur! Aka angora from bunnies. Specifically, this is a batt that I purchased at SAFF last year that is a blend of ultrafine merino, Angora, and silk. MMMMMMMMM. Yes, it is amazing to touch and spin with. Light, soft, and warm. I bought it from Bama Angoras. They have the cutest bunny pictures on their site – you should click over just for those! I’ve spun one little 3 gram sample just to see what it’s like. I’ll swatch the yarn because really that’s the final assurance that I’m happy with the results. Then I’ll adjust as necessary and do the whole batt. I have another one, in greens, that has a different fiber blend. It’s really difficult to get fiber photos right – the hue and saturation just really don’t come out well with digital cameras. 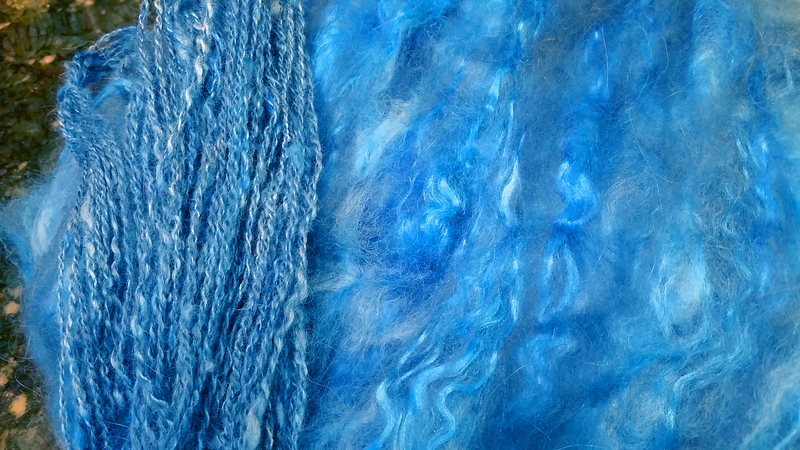 But I think I’ve got this one pretty close, lovely saturated blues with the lighter streaks from the silk. It doesn’t take dye as intensely and will always provide streaky contrast, which helps provide depth to the finished yarn. This entry was posted in Art, Fiber and tagged Angora, Angora Rabbits, Art Batts, Batts, Silk Blends, Spinning. Bookmark the permalink. 2 Responses to Bunny Time!